Toggenburg is a breed of goat named after the Toggenburg Valley region in Switzerland, where the breed originated. These goats are the oldest known domesticated animals in the world. "Toggs", as they are nicknamed, are medium in size, moderate in production of milk, and have relatively low butterfat content - 2-3% in their milk. The Toggenburg buck (males) weight approximately 200 pounds, and a doe can weigh approximately 120 to 130 pounds as adults. 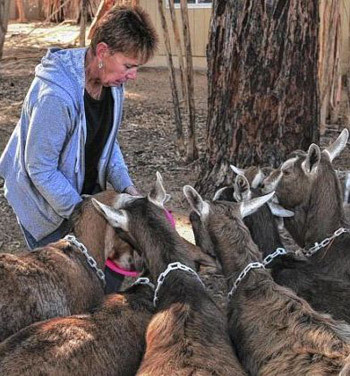 Toggenburg Goats of Arizona is dedicated to produce a quality product by feeding our animals an alfalfa diet enriched with grain and other roughage including eucalypts and mulberry which enhances their diet, most of which is grown on our ranch. Our registered Toggs are milked twice daily, except when kidding. Our kidding season typically begins in early February.